There’s a tendency to romanticise the Middle Ages because of the whole “knights” and “chivalry” thing. The material certainly makes for a good video game. Come to think of it, the last game I vividly recall casting me as a knight was 1986’s Defender of the Crown (man, I’m old), an action/strategy title that I really only enjoyed for its Medieval Times-style jousting and sword fighting events. Kingdom Come: Deliverance is a more grounded vision of Europe during the 15th century, one that wasn’t always smiles and pretty maypoles. A class system keeps the rich and royal in high standards of comfort while those below them carve out a simple existence working the land. War and political turmoil kept people in fear as one’s livelihood could be decimated under the hooves of marching armies. The game, which marks the debut of Warhorse Studios, is denser than a James Clavell novel and just as rich. Wildly ambitious in everything it does, you’ve got to have the patience and willingness to put in the time to learn a myriad of untraditional gameplay systems and buy into the realism it wants to establish. Do so, and I think you’ll find this to be one of the most enriching experiences of the year. 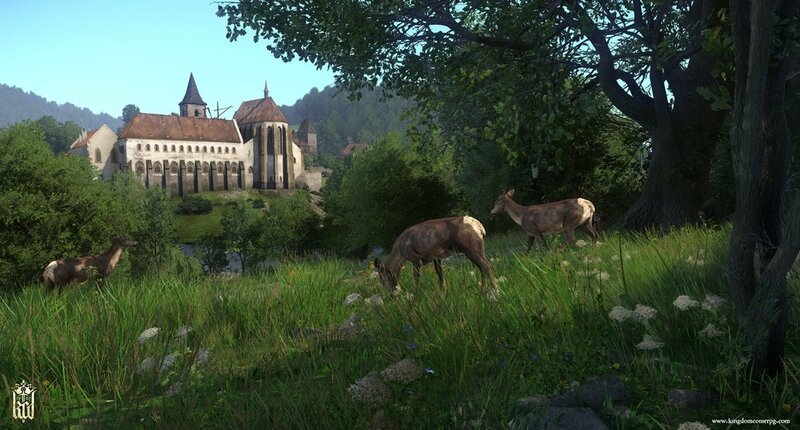 With Kingdom Come, Warhorse Studios effectively made a Skyrim for history majors. Instead of building a world where magic and monsters reign supreme they’ve drawn upon their own history for inspiration as residents of the Czech Republic, crafting a story set against the conflicts that occurred in Bohemia during 1408. After the death of Charles IV, King of Bohemia and the Holy Roman Emperor, his son Wenceslas took the throne only to quickly make enemies because of his courtly excesses. Drawing the ire of the noble class, they asked his half-brother Sigismund of Luxembourg to step in and take charge, only he took this to mean “pillage and burn half the country” after kidnapping Wenceslas in an attempt to force his abdication of the throne. The specter of Sigismund’s horde hangs heavy on the minds of Bohemia’s citizens, a fear felt in every corner of the region as refugees pour into cities and castles from parts unknown, speaking in hushed tones of another Sigismund conquest. In what feels like the opposite end of the world, young Henry harbors dreams of seeing the world despite the attempts by his blacksmith father to keep him grounded. It is sad, then, that Henry is forced to swallow a hard dose of reality once Sigismund’s armies arrive and lay waste to the village, slaughtering his parents along the way. Barely escaping with this life, Henry vows to hunt those responsible for the atrocities committed. At the center of all things is Henry. As a blacksmith’s son, he comes to the player with virtually no understanding of how the world works, which translates to his very "level 1” stats. His naïveté and a strong sense of personal justice serve as the perfect blank slate to mold him into any form you wish. Henry doesn’t level up in the traditional sense, though his progression is managed by a central character level that dictates what he can and cannot wear/use/say. Only by performing certain actions over time, such as fighting with axes, sneaking around, or converse with people will stimulate various traits such as Strength, Vitality, and Speech. In other words, the more you swing your sword and open your mouth, the better these areas will get over time. The same is said for various trades including, but not limited to, herbology, alchemy, and lockpicking that improve as you work on them. Like the Elder Scrolls series, this doesn’t pigeonhole you into any single character type. Feel free to mix things up, especially if the situation calls for a different tactic. And that’s something you’ll have to do throughout the course of the adventure. Kingdom Come can be uncomfortable because it forces you to think in a way that’s antithetical to the genre’s modern interpretations. Objectives are marked on the map as areas of interest, giving you sometimes large areas to explore with sometimes little more than “They went that-a-way” for a clue. Useable items and tools don’t stand out against the environment with special visual cues, making it really easy to miss. There’s no on-screen reticle to help you aim a bow and arrow. You can’t apply medical bandages to wounds unless you read how to do it in a book. You can’t read a book until you learn how to read. This methodical approach to game mechanics, many of which are handed to the player without explanation, can be dangerous if not given the time to research and understand. The rigors of everyday life, for example, have a significant impact on Henry’s ability to survive and thrive. Let’s use how food works as an example. Food can be purchased from vendors, stolen from carts, or looted from bodies. Eating only affects Henry’s Nourishment stat, rather than refill his health, which has to be kept in check lest he finds himself feeling hungry or, worse, starved. You could eat a lot of food to maximize the stat and keep yourself fed longer but that comes at the expense of moving slower and stamina taking longer to recharge. But you can’t eat everything! Fresh food, like cheese, bread, and various meats, spoil over time and will give Henry food poisoning of varying severity should he consume it. To play in Kingdom Come’s world means to live and breathe the law of equal and opposite reactions. Even something as simple as clothing and personal appearance can have a major impact on how you interact with others. Wearing commoner clothing, for example, won’t endear yourself to nobles and royalty. Other people may not like you if your clothes get dirty or bloody, meaning you’ll want to be nice and clean whenever possible by visiting public baths or water troughs. Taking to people is a good opportunity to get to know the world around you and learn about people which will make them easier to deal with. In one quest, talking to people would reveal clues and the next step and even more if you press them further. At some point, you’ll enter a part of a discussion that requires a check against persuasion, intimidation, and even a flirt dialog option. Henry’s stats in these areas are put up against those of the person you’re talking to and while it’s ostensibly a numbers game, other factors like reputation and presentation can move the needle towards success or failure. And then there’s combat. If there’s anything more indicative of the complicated nature of the game, it’s learning how to make use of a sword fighting system modeled after the real thing. The game strips out all of the Errol Flynn-inspired thrills of swinging a sword, restoring the contest to a dance of blocks and parries designed to chip away at the opponent’s guard until an opening can be found. Each swing of the weapon, be it a lance, sword, or hand ax, takes up stamina and without paying careful attention to your capabilities, you’ll get tired and susceptible to painful strikes from your opponent. Only by constantly switching the angle of attacks, performing feints, and last minute parries will give your weapon purchase against foes ranging from simple bandits to Sigismund's mercenaries. Sustained damage during a fight will cause unfortunate side effects, from broken bones to severe bleeding, that will seriously cripple (or kill) Henry if you’re not careful. Combat has the ability to bring a speedy end for the unprepared. A lot of times, I often wondered if combat isn’t the most desirable option. Trying to talk your way out of a conflict or use the cover of darkness to sneak past may not seem exciting but it keeps me alive, which is usually pretty great. Still, successfully parrying someone’s sword or watching them stagger back after taking an ax to the side is pretty satisfying. By now you may feel that the deck is stacked firmly against your success. Well, it mostly is. However, a perk system gives Henry a little bit of an edge against his foes. As mentioned before, your character traits--speech, strength, and vitality for example--increase in level the more you use them. For every three levels gained you can spend a skill point to unlock a perk with special passive effects and percentage boosts. Other perks, however, offer benefits at the expense of something else. In speech, there’s a perk that will offer an advantage to dialog checks against nobles and royalty and at the same time suffer a similar penalty against commoners and other lowborn. There’s another perk that lets you regenerate stamina faster at night than the day and one that gives you better rested stats depending on how uncomfortable the bed is. It’s an interesting way to mix up the experience a little bit and at best, it’s a good excuse to get some replay value in. In the end, these perks feel designed to give you ownership of Henry. How he looks and acts at the end of the adventure is solely based on your decisions, gameplay, and experiences and that prospect is really exciting to me. Henry’s not like Geralt of Rivia who walks in as a badass monster hunter and leaves a badass monster hunter. It’s this impression of character development and building that helps make Kingdom Come one of the most fascinating and engaging video games I’ve ever played. On top of that, Kingdom Come: Deliverance has some of the best presentation, spoken dialog, and writing I’ve experienced--not just for a video game but for historical period dramas in general. The writing is engrossing as it effortlessly delivers exposition in a way that doesn’t feel like you’re sitting through a history lesson. This is an accomplishment given the painful narrative intricacies that come with detailing historical bloodlines, contested successions, claims to power, and the rigidity of social class. The voice acting is on par with a well financed Hollywood film, with each voice actor, including special guest Brian Blessed, delivering genuine and believable performances to each scene. Cutscenes are presented in-engine but utilize good camera work that easily captures emotional focal points, be it lingering over dead, bloody bodies stuck in the mud or armies sounding off to each other from across the battlefield. Henry is an immensely sympathetic character and you really get the sense that he’s desperately trying to keep his head afloat as his world comes crashing down around him. He’s also almost painfully naive, something that gets him over his head time and again. I also enjoy the robust sound design because it adds so much to the atmosphere. Mud squelches under your feet, rain patters against the brushed metal of plate armor, brooks babble, and animals chitter and whine as they graze in the fields. It all works together so well to create an immersive atmosphere that is sustainable for long stretches of time. What’s more, the world with which Henry stands on spins on its own axis. We’ve seen the opposite play out in practically every seen this play out in practically every mainstream RPG: how many people have said to you that they spent over twenty hours in Oblivion before closing a second Oblivion gate? No matter how the story is framed, most open world games lack proper player urgency. After all, what’s to stop you from dropping everything to explore a mine or hunt animals. Don’t worry about the evildoer poised to launch a magic death ball into the planet, he’ll politely wait around until you’re ready. Deliverance goes out of its way to show that Henry isn’t the center of the universe. NPCs will act according to their roles and responsibilities, which means if you get a quest that says meet someone between the hours of X and Y, they’ll wait for you until it is time to leave. The sequence used for the PlayStation Experience demo, which I reached in about ten hours, features a guard captain who doesn’t care if you follow along or not. Should you wait a substantial amount of time before meeting up with the rest of the group, you’ll find that they have already made major discoveries relating to a violent attack on a village. You won’t break the fiction this way, quest objectives are fluid for this very reason, but you’ll sure miss out on interesting stuff if you dawdle. When I started playing, I expected to be frightened. Everything about it is so incredibly complex and convoluted that there’s a reason the inventory comes with an extensive codex that outlines everything you need to know about how things work. It’s easy to feel overwhelmed and confused with different mechanics (“I finally have enough money to buy a weapon but I don’t have the minimum stats for any of the good stuff!”) that I wanted to pull away. What kept me going was the story and the dramatic interplay between a Game of Thrones-sized roster of important people and places. I wanted to play in this land and see what it had to offer and more often than not, I was surprised with the result. That said, if I could change anything in this game, it’d be the save system. Saving is connected to an in-game consumable that, in the grand scheme of things, just doesn’t make much sense. I’m willing to put up with a lot but the inability to save whenever I’d like (which would be useful in a game where it’s so easy to earn fatal injuries) is a plumb nuisance. There are three ways to trigger an autosave: sleep in your own bed, start a new quest, or drink a bottle of special schnapps. Of these three, saving at the start of a new quest is the most reasonable. Sleeping in your own bed can be problematic, as I experienced while taking on quests in the city of Rattay. Because my personal bed was stationed at least two towns over, the notion of walking all the way back (even on horseback) just to save seemed hilariously inefficient. And finally, the Schnapps. You can purchase the drink from taverns but wealth is difficult to come by for the first three or so hours and the drink is expensive. You could brew your own but first, you’ll need to learn the recipe, then find the materials, then read a book on how to make the drink. Look, I get it. The early game is probably the most difficult section because Henry doesn’t have anything to his name, leaving you to scrimp and save every little thing so cut me some slack (like, give me a break: I went through an entire allotment of lockpicks trying to open a mission critical object and failed because I couldn’t wrap my head around the system and couldn’t follow through with certain objectives because I had no money to buy more lockpicks). The moment I was given control of Henry, I knew immediately that this is going to be something people will either love or hate. And that’s completely fair: this is a pretty demanding game. There’s nothing simple or easy about Kingdom Come and were it any more involved you could get away with calling it Serf Simulator. However, I can’t deny being drawn to a special something that lives just below the surface. I see the challenges presented to me and Henry as a challenge that I can’t ignore, even when I felt frustrated. It helps that I was completely pulled into the story, not just of Henry but those who crossed his path. I’m still surprised with how well the drama is acted and how the script effortlessly transports you into a Medieval Europe frame of mind without too many anachronisms to ruin the flow. You don’t see very many video games like this and even though there’s still more game to play, I find the whole thing very cool. Kingdom Come: Deliverance requires a whole lot of patience, reading, studying, and analyzing how things work. Beyond these hurdles lies a fine piece of interactive historical fiction. From top to bottom, Alaska fails to inspire any sense of wonder, mystery, or excitement. That last one might sound strange - how can life in the Alaskan wilderness be “fun?” It kind of isn't and instead of trying to find your own fun out of the mundane, the developers at Wreck Tangle Games trap you inside a fiercely linear story punctuated by the most oddly designed mini-games I have ever experienced.